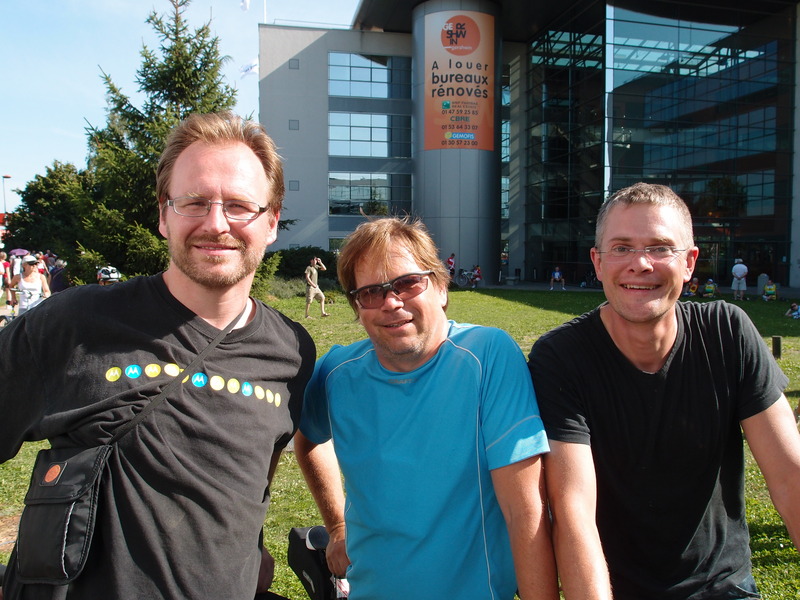 PBP 2011: Time to Ride! This is a short post tonight because we have to get to bed for a few hours before our start on Monday morning at 5 a.m. Paris time. John Mangin of Colorado at the start. The first wave of 80-hour riders start the trek to Brest. 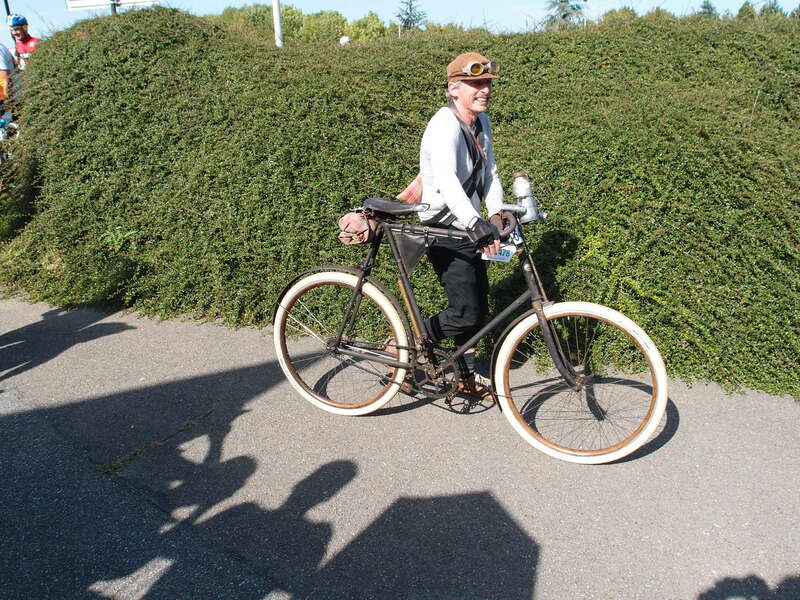 Drew Buck on his 1900 Peugeot bike. Note the high top tube — he had to climb aboard via a rear axle peg. Swedish riders cheering at the start. Tandems at the 90-hour special bikes start. Single bikes came quickly after the tandems, recumbents and HPVs. The other groups of riders took off earlier this evening in very warm conditions, bright sun and 80s. We completely enjoyed the amazing energy they projected at the start and along the early part of the route, which goes right by our hotel. So, as they make their way to the west, we’ll think of them before joining the fun tomorrow. One of the neat things about the 84-hour group is that we get to be spectator and participant. MG and I would also like to extend our sincerest thanks to the PBP volunteers at check-in. They greeted us warmly and got us through in no time. We’ll be posting from the road via Twitter: follow @dailyrandonneur and @gypsybug, and we plan to attempt a quick post to TDR and Chasing Mailboxes each night, as time allows. To our fellow riders, good luck and tailwinds! Our son started off with that 5 a.m. group. 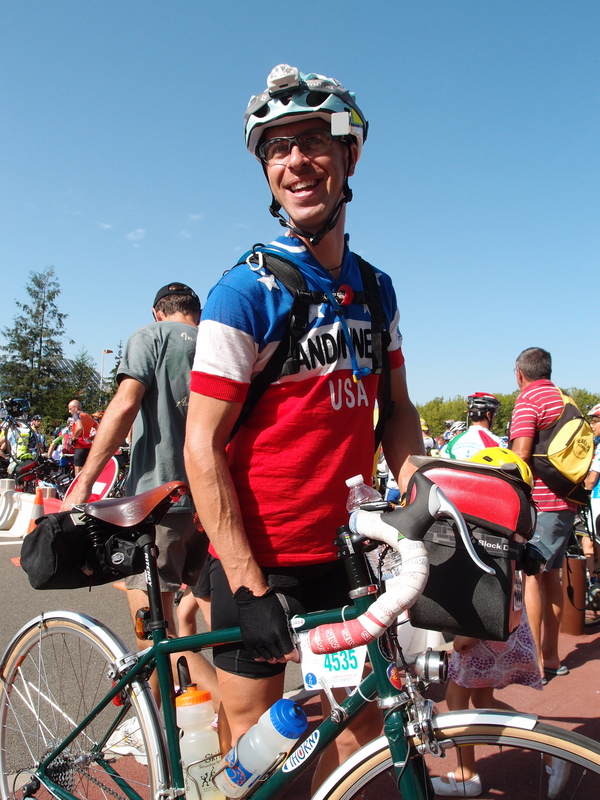 He is part of the Seattle Randonneurs. I’m having a hard time projecting myself ahead to Paris time – we are 9 hours in the past. Love your pictures! Thanks for sharing. Janet, I’m having the some struggle, too, with the time difference. I’m sitting in Seattle very confused about what day and time it is ANYWHERE, let alone along the route my Michael is riding in France! ← PBP 2011: Inspection Day, One Day to Go!